Original sin – does it matter? Does it matter whether we subscribe to the Reformed doctrine of original sin? In particular, does it make a difference if we accept the idea of Adam’s sin imputed to us, or not? View 3 acknowledges universal guilt (all have sinned), but doesn’t do justice to the ‘reign’ of sin – sin as a power that dominates mankind. Mankind is theoretically free to not sin. View 1 ‘Inherited corruption’ is a way of acknowledging this power of sin. Mankind is universally enslaved and as a result guilty. So can adherents of 2 get on happily with view 1? And vice-versa? I can’t see why not. There doesn’t seem to be anything much at stake between these two. – I’m not a huge fan of that doctrine. – even if I were, I wouldn’t buy that. Imputation of Christ’s righteousness doesn’t depend on a corresponding imputation of Adam’s sin. Adam is ‘a type of the one to come (v.14) but that doesn’t mean the parallel can be pushed to just any length. It means there are ways in which Adam is like Jesus. It doesn’t mean Jesus’ achievements are a formal mirror-image of Adam’s failures. Indeed v.15-17 highlight ways in which Jesus’ work does not formally match Adam’s: ‘But the gift is not like the trespass…’. When people say ‘unless Adam’s sin is imputed to us, Jesus’ righteousness is not imputed either’, they are pushing the analogy too far. I’m not that sure about Reformed ‘imputation of righteousness’, but I wouldn’t try to argue against it using Adam. So I think we can get a pretty robust doctrine of sin without needing to go beyond what Scripture clearly teaches. In the absence of a knockdown prooftext for imputation of Adam’s guilt, view 1 seems to me pretty much coherent with the rest of Reformed doctrine. And it has strong Scriptural backing. View 2 seems to claim too much unnecessarily. My feeling is we can afford to let the imputation aspect of ‘original sin’ go. Adam and original sin – how far can we go? Romans 5:12ff is considered the key passage for the doctrine of original sin. How much of that doctrine does it actually establish? The things we learn about Adam, we learn incidentally. That’s not good news for our doctrine. When the key passage is not trying to answer the questions we’re asking, that should put us on our guard. In my view it knocks a bit of a discount off the certainty we can have in our conclusions on the question of Adam. 2. Paul portrays sin as a subject, and active agent or force. Sin entered the world. It was in the world. Sin multiplied under the law, so that it reigned. It reigned in or through death. Yet our traditional doctrine treats original sin as an abstract absolute: the guilt of Adam imputed to us all. Hard to see how that would come from this passage. 3. What caused sin to not just exist in the world but to reign, was the introduction of the law, which enabled sin to multiply. This is an existential description of sin’s power increasing over mankind through disobedience, so that eventually it can be said to reign. Our Reformed doctrine treats sin’s reign as first and foremost something absolute and judicial: all mankind falls under the verdict passed on Adam, and so sin affects the fate of all. In this sense it reigns. Hard to see how this reign could increase or have degrees, or how the law could affect it. The Reformed doctrine is about people’s status, not their experience. So it seems the universal imputation of Adam’s sin is not to be equated with the ‘reign of sin’ in Romans 5. The ‘all sinned’ here is a historical truth. Sin corrupted the whole of mankind. Death followed. The Reformed take on this is that ‘all sinned’ here is a judicial truth: all mankind were considered to have sinned in Adam’s one sin. ‘All sinned’ is, so to speak, an event in God. But we have seen that for Paul, it is a process in human history. So far not many of the distinctive points in the Reformed doctrine have found confirmation in Romans 5. This is not to say that the doctrine is wrong, just that it’s not easy to find it in Romans 5. The more widely accepted Christian doctrine of sin – that Adam’s first sin opened the door to sin in the world, and so all were ‘infected’ and destroyed by sin – this is pretty clearly Paul’s view here. The Reformed view accepts all that, of course: but it also pushes further towards inherited guilt. It’s these extras about imputation that we’ve been particularly trying to establish. 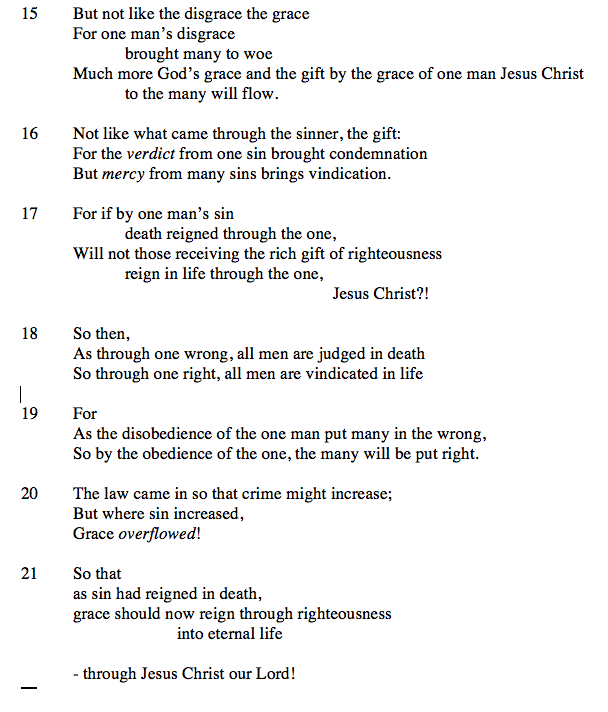 So far, from my study of Romans 5, I don’t feel I can go all the way with the doctrine of original sin. Commentaries on Romans 5:12-21, about Adam and Jesus, normally talk about the universal nature of sin. They generally talk about justification and a fresh start in Jesus. That’s good. But once you get the link Paul makes between justification and resurrection (see previous posts on this), suddenly it becomes clear that resurrection is a strong theme here also. Paul contrasts the death that came through Adam with the life that comes through Jesus, and he links that life closely with justification: ‘the justification of life’, ‘those who receive the gracious gift of righteousness will reign in life’. This is clearly resurrection talk. The condemnation in Adam takes the form of death: the vindication in Christ takes the form of resurrection. The gift of ‘righteousness’ enables Adam’s dead family to not only live but to reign, with the risen Jesus who sat down at his Father’s side. 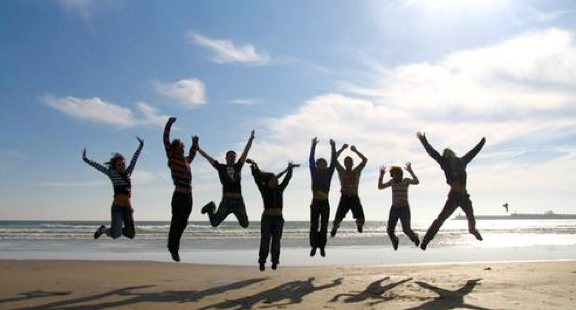 They enjoy the reign of grace, which works ‘through righteousness to eternal life.’ I.e. the way that God’s justifying gift is expressed is in life eternal (resurrection life). As so often in Paul, the message here is, ‘in Adam we died through sin: in Messiah Jesus we are raised because of righteousness.’ Paul has us in the story again. So I reckon any exegesis of this passage needs to take the death/resurrection contrast into account. Adam brought us death. Jesus brings us resurrection. And that’s a theme the commentaries generally miss. Romans 5:12f has long been used to base the Reformed doctrine of original sin, i.e. that Adam’s sin is imputed to us all – we all sinned in Adam – so that we are all guilty because of that one sin. John Murray’s Romans commentary (otherwise helpful) is an exponent of this view. This doctrine is of course the ‘mirror’ image or converse of the doctrine of Christ’s imputed righteousness, which has been in our sights at The Grit lately. From Adam we inherit guilt, from Jesus righteousness. Since Romans 5 is the key text for this doctrine of imputed original sin – in fact, pretty much the only text – we want to re-examine the exegesis of that passage fairly carefully. It’s more important than usual to get it right when the whole doctrine stands or falls on this text. We started by raising the concern that the genre of the passage has been largely ignored: it is poetry (see previous post). Now we’d better make good that claim. In this passage (especially v.15-21) Paul chooses his words deliberately for their aural qualities: the passage is full of rhymes. He even occasionally chucks in a term that isn’t perhaps strictly the right one, because it rhymes. For example, v.18 Adam’s side is: “one sin (paraptoma) leads to judgement for all humans.” Jesus’ side is: “and one dikaioma leads to the justification of life for all.” Now there is no way dikaioma is a natural opposite to paraptoma (sin). It’s not the word you would normally choose for the job here. It’s not the word Paul reaches for any other time to express this contrast. Dikaioma means righteous statute or judgement. It never normally means righteous deed, which is what we’re expecting here. The translators are expecting ‘righteous deed’ so strongly, they put it in even though it’s not a good translation for dikaioma. 1. Paul stretches the meaning of dikaioma, to mean ‘righteous deed.’ It would then stand for the converse of Adam’s sinful deed (paraptoma). The parallelism of Jesus vs Adam is preserved. But it’s a semantic stretch! 2. By dikaioma Paul means ‘God’s righteous judgement in justifying Jesus.’ In which case the strict parallelism of the verse is sacrificed – Adam’s sin compared to God’s judgement, where it should strictly be compared to Jesus’ obedience. This however gives a more natural sense to dikaioma. Either way (and I lean towards option 2) Paul sacrifices precision and clarity at this point. Why does he choose this word, dikaioma? Clearly Paul has chosen the word because it rhymes with paraptoma in the parallel clause. The alternatives he might normally have used, such as dikaiosune or hupakoe, don’t. Paul is writing a song here, he’s giving himself poetic licence. His priorities are poetic: whatever else it does, this sentence must flow and feel good to speak. It must be lyrical. This is one of the most obvious instances of Paul adopting a poetic style is this passage. There are many others. If you read out the greek, you can hear them. That’s what I was trying to capture in my translation (see prev. post). So what does this mean for exegesis? It means there are genre issues to be considered. The passage is not in Paul’s typical epistolary (letter-writing) style. And as they taught us at college, in exegesis genre must rule. Genre clues us in to Paul’s aim. He’s not in didactic mode here. He’s in celebration mode. This tells us that this long string of statements is not to be taken as so many propositions to be analysed for doctrinal purposes. It might be better to see Paul as piling up boast upon boast, thinking of as many different ways as he can to celebrate Jesus’ superiority over Adam. The thing Paul most wants to communicate here is the overwhelming glory of Jesus’ achievement. Genre considerations, then, suggest that we need to allow for poetic strategies, and poetic licence. We shouldn’t subject this passage to the same kind of precise and technical exegesis that we use elsewhere in Paul. But that’s exactly the kind of exegesis that has been used to establish the Reformed doctrine of original sin from this passage. I’ve felt pretty unsure for a long time about how we interpret Paul on Adam and Jesus in Romans 5, second half. It’s a pretty important passage cause it’s pretty much the only passage we get the doctrine of original sin from. In particular, the Reformed doctrine of Adam’s guilt imputed to us. I wonder how you feel about that doctrine? In the spirit of The Grit, I’d like to take another look at this key passage. My first concern from an exegetical point of view is that no one seems to acknowedge it’s poetry. Paul has written a poem about the great victory of Jesus’ work over Adam’s work. The approach to justification we’ve been outlining highlights a significant challenge faced by evangelicalism today. The propositional approach to theological thinking (at the simplest level think the 4 spiritual laws, etc) which has for so long been our dominant mode, is no longer working well for us. It is increasingly losing traction in a society preoccupied with authentic experience and connectedness. Seems to me the people in our churches (i.e. we) are becoming increasingly alienated from theological thinking of this sort, which has come to feel arbitrary and sterile. The challenge is this: can we reconnect the doctrines of our faith with the gospel story, rather than holding them in abstract propositional terms? This is hard for us. For so long we’ve long been enamoured of the power of propositional statements. Of course all along we’ve had the apostles’ creed in the background of our collective consciousness, encouraging this sort of narrative approach. But it’s been overshadowed by other ways of formulating Christian faith, which have appeared to do more work for us. I have no problem with propositional statements. They are useful and a good thing in themselves – but not when they replace the gospel story as the setting in which our theological thinking is done. The great danger of propositions is their abstracting potential: the ease with which they allow us to pull theological truths out of their proper context and treat them, either in isolation or else in a foreign setting. This abstracting leads to severe distortions in our faith. Right at the heart of protestant faith, in the doctrine of justification, this distortion is particularly evident. We’ve got the elements right enough, but the way we structure the doctrine is wrong-headed. The death of Christ gets treated as an event which has a self-contained meaning without reference to the story it is part of. Without the constraints imposed by the story, we have been free to load up Jesus’ death with any and every meaning we wished to place on it. 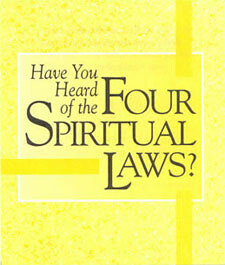 The guiding force can easily become the needs of our own system, rather than the Scriptures. Witness, for example, the debate about particular redemption (‘limited atonement’): who exactly did Jesus pay the price for? Not only is the issue difficult to find in the New Testament, it’s difficult to relate it in any way to the gospel story as presented there. It’s a debate generated in the realms of abstraction. Somehow or other we have made the unfortunate move of identifying justification primarily with Jesus’ death. Unfortunate, because in the dynamic of the Jesus story, death means condemnation; it is resurrection which correlates with justification. In our abstracted approach, his death brings justification, and his resurrection brings nothing very clear. But it’s just not presented like this in the Gospels. And so we read these documents (eg with seekers) and then feel it necessary to make sense of them by adding on a whole swag of extra doctrine that you couldn’t get in the Gospels themselves. Problem. But once you get to thinking of Jesus the way the Gospels present him, as the representative Israelite, or the new Adam (to pick on Lukan catergories), then his death and resurrection have a very clear meaning. Death = judgement on the old order. Resurrection = rescue and life for the new order. And it’s all there in the text of the story: Jesus’ crucifixion spells the condemnation of Israel and of the world (see e.g. Luke 23:27-31). It is his explicitly his resurrection which enables him to fulfil the role of Messiah, breathing out the new Spirit (i.e. new life) into his new people (the church) at Pentecost (Acts 2:33, 36, 38). By keeping our theology at a distance from the narrative, we have been able to sustain a doctrine of atonement which is in considerable tension with this Gospel story. It hasn’t done us many favours, and it’s time we did better. I’ll stick my neck out and say I think reconnecting with the narrative is the biggest challenge facing the evangelical theology today. What have we done? We’ve reconnected the doctrine of justification with the gospel story. Simple as that. Where does that leave us, theologically? A few suggestions. Seen in this light, justification becomes a thoroughly Trinitarian act. One of the disturbing things about the classic evangelical exposition of ‘justfication’ is the relative absence of the Holy Spirit in the whole matter. Justification is seen as an act of God the Father, imputing righteousness to us for the sake of his Son. The Spirit has little role here. And since this is ‘the doctrine on which the church stands or falls’, ‘the hinge on which the whole faith turns,’ the result is a dangerously non-Trinitarian centre to modern evangelicalism. Once the doctrine of justification is restored to its proper place as an explanation of Jesus’ resurrection, however, all this changes. Justification is clearly seen as the work of the Father by his Spirit towards his Son, proclaiming over him the verdict of ‘life’. ‘He was put to death in the flesh, but made alive in the Spirit’ (1 Peter 3:18). Our justification is likewise understood to be our sharing in this positive verdict, when we are united to Christ and receive the new life of the Spirit in him. The apostolic view of justification cuts through our evangelical debates about imputation. We need to remember that the imputing of righteousness is the act of a judge when he declares one party to be in the right; so then this imputation is equivalent to justification, simply another way of saying the same thing (Rom. 4:5-7). Every judge imputes righteousness (and guilt): that is his job. Everyone who believes that God is the judge, believes in imputation by definition. So much of our confusion over imputation comes because we lose sight of the meaning of the concept, and overplay the idea of abstract accounts into which ‘righteousness credit’ is placed by God. The forensic setting of the term is easily obscured in much of our justification talk. But once it is grasped that imputing righteousness is a declarative act of the court, the question, whose righteousness is imputed, becomes a strange one. It is difficult to give the question any clear meaning in a judicial context. Righteousness is a status created by the court, it is the court’s righteousness if it is anyone’s. A more natural and helpful question, the one frequently asked in the New Testament, is whose justification? Who is the object of God’s justifying verdict? The apostles’ answer is, Christ. It is to Christ that God imputes righteousness. God declared him righteous because of his righteous life. Our justification is not a separate verdict given to us on the basis of some transfer of merit. It is simply our sharing in the one verdict given to Jesus at his resurrection. Righteousness is imputed to us because it was imputed to him. To put it another way, the only person justified on the basis of Christ’s righteousness was Christ himself. The apostles do not teach that we share his righteousness: they teach that we share his justification. This Gospel-based view of justification also helps reveal the essential unity between Paul and Jesus on a central gospel issue. Paul’s teaching at this point is in no way a departure from that of the Gospels. Much modern scholarship is on entirely the wrong track here. On the contrary, Paul’s doctrine of justification, like all his teachings, is nothing but an explanation of the meaning of the gospel events – or, if you like, it is his working-out of the significance of his encounter with the risen Jesus on the Damascus road. In other words, we are left with one gospel, not two. For a long time we’ve put up with two gospels. One is a story about Jesus, including past, present and future elements. The other is a set of ideas, teachings, or propositions about salvation, which we derive from Paul’s epistles. The two have little overlap: they are very different sorts of thing. A narrative view of justification reunites these two, so we have just one gospel again. That’s enough gospels, don’t you think? It was Paul’s encounter with the risen Jesus which led him to develop his distinctive teaching of justification by faith. Paul too understood Jesus’ resurrection as his justification. Because the residents of Jerusalem and their leaders did not recognize him or understand the words of the prophets that are read every sabbath, they fulfilled those words by condemning him. Even though they found no cause for a sentence of death, they asked Pilate to have him killed. When they had carried out everything that was written about him, they took him down from the tree and laid him in a tomb. But God raised him from the dead. Notice the contrast between condemnation and resurrection, as two sides of the coin of judgement. When condemnation is overturned, it is turned to resurrection. Let it be known to you therefore, my brothers, that through this man forgiveness of sins is proclaimed to you; by this Jesus everyone who believes is justified from all those sins from which you could not be freed by the law of Moses. The ‘therefore’ here is key: since Jesus has been vindicated in resurrection, justification is offered to the people through him. Paul employs the same structure of thought in his epistles. In his letter to the Romans, he describes a very similar final judgement scene to that envisaged by Jesus. God the judge separates all mankind into two groups. ‘To those who by patience in well-doing seek for glory and honour and immortality, he will give eternal life… glory honour and peace’. For ‘the self-seeking…there will be wrath and fury’ (Rom 2:6-10). God’s judgement is righteous and true, ‘he shows no partiality’ (v.11). It is within this framework of God’s justice that Paul explains the story of Jesus. The heart of that story, announced upfront, is that Jesus was ‘appointed Son of God in power…by his resurrection from the dead’ (Rom 1:4). Jesus receives God’s final judgement: ‘glory, honour and immortality.’ In thus vindicating the righteous Jesus, God himself is seen to be righteous, fulfilling his judicial promise that ‘the righteous one by faith will live’ (Rom. 1:17). The rightness of God’s judgement is revealed when he raises faithful Jesus from the dead. But Jesus’ story is not simply his own. For ‘he was handed over to death for our trespasses and was raised for our justification’ (Rom 4:25). And so this same righteous judgement will now be shown to all who are united to Jesus through baptism and the Spirit: they too will be justified in resurrection (Rom 6:1-5; 8:9-11), raised with Christ. Those who had no hope of receiving the verdict of ‘glory’ or ‘honour’ (= eternal life) from the judge (Rom 2:6-11; 3:23), now rejoice in precisely that hope of glory (Rom 5:2). They can have that hope because the reward now comes to them as a gift, found ‘in Christ’. This justification through resurrection has actually already begun inwardly in believers: they already receive the favour and reward of the heavenly court (Rom. 5:1). They have been raised with Christ inwardly through faith (Rom 6:1-11, cf. Ephesians 2:5-6; 2 Corinthians 4:10-11, 16), to participate in the life of the age to come now (Romans 5:5, cf. Colossians 3:1-4). And they await the outward and public justification of the final resurrection, when there will be no room for condemnation (Romans 8:11, 34). Who will bring any charge against God’s elect? It is God who justifies. Who is to condemn? It is Christ Jesus, who died, yes, who was raised, who is at the right hand of God… (Romans 8:33-34). The payoff of Jesus’ resurrection is all about our justification. And so our faith, though it trusts in everything Jesus does and says, is particularly to be centred or focussed at this point: “if you confess with your mouth, “Jesus is Lord,” and believe in your heart that God raised Him from the dead, you will be saved.” (Romans 10:9). “Righteousness will be credited to us who believe in Him who raised Jesus our Lord from the dead. He was delivered up for our trespasses and raised for our justification” (Romans 4:24-25). Paul and the other apostles tell this story over and over, always making it at the same time Jesus’ story and our story, as we are united to him: ‘Therefore just as one man’s trespass led to condemnation for all, so one man’s act of righteousness leads to the justification of life for all’ (Romans 5:18). ‘In his great mercy he has given us new birth into the hope of life through the resurrection of Jesus Christ from the dead’ (1 Peter 1:3). We could go so far as to say, based on this evidence, that the apostle Paul didn’t have any concept of justification apart from resurrection. Following Dan W’s excellent review of Gaffin’s book, over the next three days I’m planning to post a three-part article on justification. I’ve set myself the modest goal of trying to salvage the doctrine out of the doldrums into which it’s fallen in my church scene. Here’s part one: the groundwork. For a long time now the protestant doctrine of justification has been more-or-less detached from the gospel of Jesus. Without this mooring, it has been drifting off into the world of abstract ideas. It has become increasingly difficult to connect ‘justification’ to anything else at all, either in our Christian faith or in the real world. In particular, the doctrine of justification has long been formulated apart from its proper foundation in the resurrection of Jesus. Without that foundation, it’s been getting increasingly wobbly. It’s time to restore the doctrine to its rightful place in the gospel of Jesus Christ. What follows is an outline of what a reconnected doctrine of justification would look like. Jesus taught about justification. In the Gospels, Jesus describes the scene of God’s final judgement: the ‘righteous’ (same word as justified) are placed on the judge’s right, the place of justification, and the wicked on his left, the place of condemnation (Matthew 25:31-46). While the condemned ‘depart into fire’, the righteous inherit the life of the kingdom. Elsewhere, Jesus explains that this judgement will come through resurrection: the ‘resurrection of life’ or the ‘resurrection of condemnation’ (John 5:29). ‘Life’ here is clearly a synonym for ‘justification’. However, this resurrection-judgement can also be brought forward: in the parable of the Pharisee and the tax-collector, the two come to pray at the temple. But the temple scene turns out to be a judgement scene: God justifies the despised one and rejects the Pharisee who judged him. This justification is described as ‘raising up the one who exposed himself to shame (tapeinon)’ (Luke 18:14). Jesus’ passion/resurrection story is itself a kind of extended judgement or court-room scene. He is acknowledged to be innocent (Mark 15:14) yet condemned to death, first by Israel and then by the nations (Mk 14:64; 15:15). His condemnation consists in this: that he must die in shame. Jesus had predicted this negative verdict in advance: ‘The Son of Man will be handed over to the chief priests and scribes, and they will condemn Him to death.’ However he predicted a final judgement scene in which his condemnation would be overturned through resurrection: ‘but he will be raised on the third day’ (Matt. 20: 18). At his death, Jesus commits his cause into his hands of his Father, the final judge (Luke 23:46). As the innocent one he ‘entrusts himself to the one who judges justly’ (1 Peter 2:23). On the third day his ruined body is raised into new and glorious life by the Spirit. He has experienced the final judgement of which he taught: in his case, the verdict is vindication. This verdict is experienced in resurrection, the ‘resurrection of life’. When Jesus’ apostles later face the high court of Israel (Sanhedrin), they emphasise the forensic significance of Jesus’ resurrection: ‘You killed Jesus,’ they tell the court, ‘but God raised him to his right hand’ (Acts 5:30-31). In other words, the verdict of their human court has been reversed by the final authority. They had condemned Jesus but God vindicated him by resurrection. Jesus has played the part of the tax-collector from his own parable: he has exposed himself to the shame of the cross. But God has justified the despised one by raising him up. The one who judges justly has upheld the cause of his righteous, trusting Son. The direct importance of Jesus’ resurrection for the first Jewish hearers is twofold: firstly he has become the King of Israel and giver of the eschatological Spirit (Acts 2). Second, they are thereby pronounced guilty of murdering God’s Messiah. An unexpected further result of Jesus’ resurrection, however, is that the apostles can announce entry into the new life of the Spirit, including acquittal from sins (Acts 2:38). These blessings can be enjoyed through being joined to the crucified and risen Jesus in baptism: ‘baptism into the name of Jesus’. The Jerusalemites can experience the same reversal of judgement that was given to Jesus: from condemnation to acquittal. They are invited to share in the verdict Jesus received from his Father. Jesus is sending out his disciples (the twelve, then the seventy) to do mission. And this is part of his instructions: if they won’t welcome you ‘shake the dust off your feet against them’. A symbolic act: God will shake them off in the same way. Perhaps also the judgement on that town will be so severe, you don’t want any connection with it, not even with its dust. What sort of application could this have to mission today? So we usually only invest in people’s lives as long as they show a real interest in the gospel. We’ll stick with them, as long as they stay keen. If they lose interest, we’ll find someone else to focus our attention on. That’s our version of ‘shaking off the dust’. We move on. Is that a good application of Jesus’ teaching to our setting? I don’t think so. 1. Jesus’ teaching is given to itinerant evangelists, not to ordinary citizens. Both times this instruction is carried out in Luke-Acts, it’s in the context of itinerant ministry (Acts 13:51, 18:6). Most of us are not itinerant evangelists. Application for us will mean taking account of our more ‘settled’ setting. We can’t literally ‘move on’: my neighbours will still be there tomorrow! 2. The towns Jesus sends these evangelists to are not just any towns. They are Jewish towns. Two ways those towns are different from my town. First, the inhabitants are the heirs of the covenant with Moses. They have 1400 years of history with Yhwh, 500 years of prophetic expectations for the coming of Messiah. That’s a lot of preparation time. When the Messiah is announced, they’d better be ready. These are towns that have been given every chance. They’ve been singled out for the privilege of having the Messiah living and ministering amongst them for a long time. The Samaritans hadn’t had all these privileges. (Neither has Sydney.) And when they reject him, Jesus doesn’t give them the ‘dust off the feet’ treatment. It’s a fact that both times this instruction is carried out as recorded in Luke-Acts, it’s Jews who are being ‘shaken off’, not Gentiles. Gentiles never get this treatment in the Gospels/Acts. 3. This instruction comes at the end of Jesus’ Galilee ministry. He’s now leaving, heading for Jerusalem. He’s not coming back. It’s their last chance. It’s in this context that the ‘shake the dust’ instruction is given. This was probably not Jesus’ normal modus operandi over the previous three years. These considerations make it hard for me to imagine Jesus giving us the ‘shake the dust’ instruction for general use on our neighbours here in poor pagan Sydney. Exegetically, I can’t see any justification for applying the practice to them. But here’s an interesting thought: would anyone be valid recipients of this treatment today? And if so, who? I’d love to hear people’s ideas.